Trump ‘likes’ a killer, tyrant, despot? What in the name of international diplomatic norms is going on here? 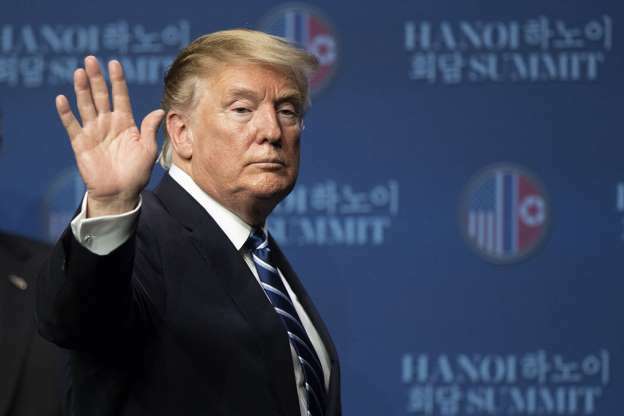 Donald Trump’s administration announced sanctions against North Korea, citing its recommitment to building its nuclear arsenal despite promises to “denuclearize.” Then the president, without consulting anyone, reverses his own administration. The president removed the sanctions. Why? About all we got immediately came Friday from White House press secretary Sarah Huckabee Sanders, who said only that Trump “likes Chairman Kim” Jong Un, the tyrant/killer/despot/madman who runs the reclusive Marxist regime in North Korea. The president who dismisses American war heroes, denigrates U.S. intelligence analysts, questions his homeland security team, ignores the advice he gets from “the best people” surrounding him “likes” a guy like Kim Jong Un — the overfed dictator who starves his own people. Go . . . figure. If you can. The world must have been hallucinating when the great powers announced that framework agreement with Iran that calls for the Iranians to scale back dramatically their nuclear development program. Many of us out here thought for sure the economic sanctions on Iran would be lifted after the Iranians complied with each step of the agreement. Now we hear from Iranian President Hassan Rouhani that he wants the sanctions lifted before he puts his name on an agreement. I must have been dreaming the agreement that was announced. How can the Iranian leader say with a straight face that the sanctions must go and then he’ll sign? That’s how these things are supposed to go. President Obama is facing a tough choice here. Does he stick with the agreement and try to talk Rouhani out of his nonsensical demand or does he possibly walk away from the deal? Some on the right think he needs to walk away. Maybe, but not yet. I think that the head of state of the world’s greatest military and economic power needs to tell Iran — through intermediaries, of course — that the sanctions are going to remain until the Iranians do what they’ve agreed to do. They’ve agreed to scale back their centrifuges and they’ve agreed to strict inspections from international observers. If they comply with all they’ve agreed in principle to do, then the sanctions can come off. It turns out President Obama is going to be up front and visible as he responds to North Korea’s alleged cyber attack on a major American company. He took time from his vacation in Hawaii to sign an executive order slapping economic sanctions on North Korea. I’m still thinking the president had a hand in North Korea’s Internet crash shortly after dictator Kim Jong-Un bullied Sony Pictures into holding back release of “The Interview,” a fictional story about a plot to assassinate the North Korean dictator. The bullying included the alleged hacking into Sony’s emails and other communications. Obama threatened a “proportional” response. Now we have the sanctions. They’re sweeping and designed to bring serious economic pain to a government known for bringing plenty of pain of its own to its people. Will the sanctions work? Well, Kim Jong-Un ought to ask Soviet strongman/president Vladimir Putin about the effectiveness of these sanctions. President Obama makes it clear: There will be no U.S. military intervention in Ukraine. Meanwhile, Russian President Vladimir “Tough Guy” Putin makes it equally clear: Don’t mess with Russia. Now, are the Russians tougher than we are? Which military establishment is stronger than the other one? This loyal American knows the answer to both questions. None of that is the issue. World peace and the consequences of trying to force the Russians out of Ukraine militarily are too horrible to ponder. The only option now must be the economic one. The European Union is pondering even more stringent sanctions on Russia. So is the United States of America, working in concert with the EU. Meanwhile, the critics back here at home — far away from the struggle — keep yammering about the “military option.” None exists. Russian troops reportedly have “invaded” Ukraine, violating that country’s territorial sovereignty. Obama has condemned the Russians, including Putin. He’s vowing that Russia will pay a price for its violating its neighbor’s territory. The sanctions already imposed are taking a big bite out of a Russian economy that’s on the ropes as it is. Are we going to bomb the Russians? No. We should put the economic squeeze on them. Keep tightening the vise, Mr. President. The Group of Eight industrialized nations has reduced its ranks by one. The more I think about it, this might be the unkindest cut of all that Russia will endure as punishment for its interference in Ukraine’s sovereign affairs. The G-8 is now the G-7, as the remaining nations have given Russia the boot. The G-8 had planned to meet in Sochi, Russia. The G-7 will meet in Brussels, Belgium. The punishment is going to sting because Russia sought hard to be included in the industrialized consortium of nations after the Soviet Union collapsed in 1991. Joining the other great industrialized powers — such as the United States, Great Britain, Japan, France, Italy, Canada and Germany — meant a great deal to a nation struggling to find its way out of its communist past. The Russian Federation emerged from the post-commie era a corrupt and struggling nation. Then it took its place at the table along with the other great industrialized powers. Now it’s been relegated to pariah status, owing to its takeover of Crimea, its interference in Ukraine’s political unrest and its threat of more military intervention. It’s been suggested by some in this country that the United States should arm the Ukrainians, that it should rattle its sabers more loudly. U.S.-led economic sanctions already are beginning to bite. Will they persuade Russia to back out of Ukraine? Probably not. Will the G-7 decision to no longer include the Russians change the Kremlin’s attitude? Again, no. It’s still going to sting. A lot. As it should. The media have this habit of latching on to words without clarifying their context, meaning or importance. President Obama today announced he is expanding the sanctions being leveled on high-level Russian officials who have played any important role in Russia’s aggression against Ukraine. Being a reasonably well-read individual, I think I know what he means by “sanctions.” The president is using executive authority to freeze assets of individuals high up in the Russian government. They’ll be unable to move money around. They’ll be hit where it hurts, in the bank account. I think that’s what the word means. The media, though, ought to explain these sanctions and how the U.S. government intends to inflict enough pain on Russia’s government to make it stop interfering in Ukraine’s internal affairs. If the media cannot do it, then they should ask White House officials, Treasury Department gurus, Federal Reserve Board brass, high-level Ivy League economists or anyone else with intimate knowledge on how these things work to explain to us unwashed masses. It’s a nice word. It seems so clinical, so clean and so, oh, bordering on meaningless unless you can define how the sanctions actually work.